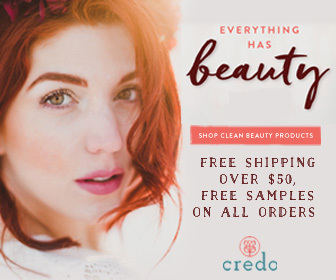 I don't know about you guys, but when it comes to green beauty, I do most (to all) of my shopping online. I've fallen in love with so many different brands that the ability to shop them all at once is more than a little enticing. 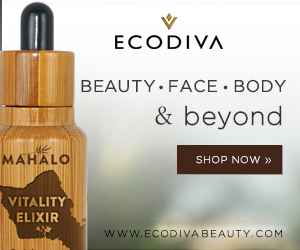 That's why one of my favorite places to shop is EcoDiva Beauty, an online store filled with some of the best brands, ranging from Mahalo Skincare to One Love Organics. Recently I tried out a few picks from some of my favorite brands the store offers, and I thought I'd share a few thoughts below. Before even opening the bottle for this heavenly formula, I knew I'd be in love. Not only because One Love Organics can truly do no wrong, but also because I knew this body polish would have the same dreamy scent as the brand's Vitamin B Cleansing Oil* (which I reviewed here). That's right, this beautiful body polish smells like a tropical blend of pineapples and papaya, a scent that immediately wakes me up during my morning shower and puts me in the best of moods. Now, as gorgeous as the scent is (seriously, I could go on and on about it), I'd be remiss not to mention how well this polish performs at its intended task — exfoliating. The formula combines the hydrating properties of aloe, shea and vitamin C with raw, organic sugar crystals, for a gentle but strong exfoliation. Unlike many other natural exfoliants, these crystals stick together, allowing you to use just a bit of this formula without the whole thing falling apart (if that makes any sense). It's one of the best body polishes I've ever used, and I will definitely be repurchasing once I run out. 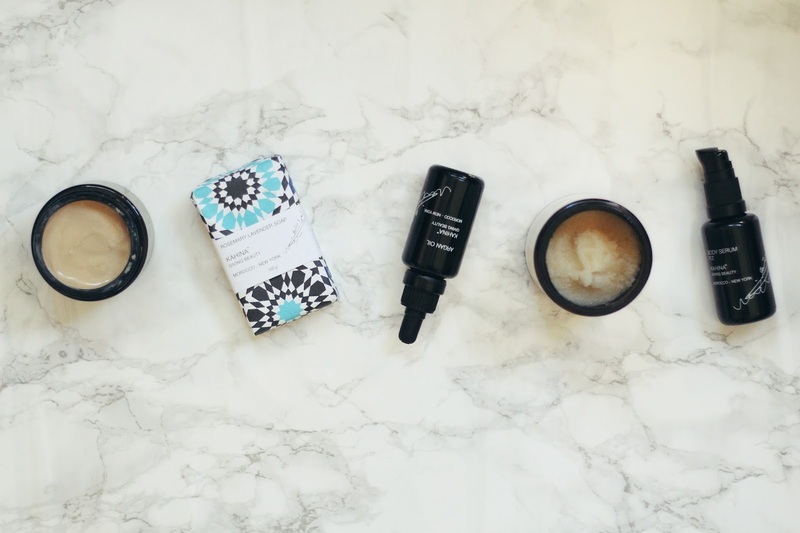 I've reviewed (and loved) a few picks from Kahina Giving Beauty in the past, but I was thrilled to try out the contents of the brand's Glow Box*. 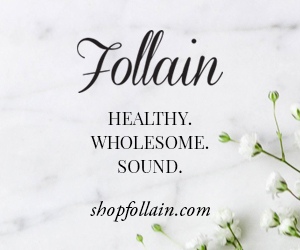 The box includes smaller sizes of their best-selling Argan Oil and Fez Body Serum, as well as their Rosemary Lavender Soap, none of which I have tried in the past. While I'm not usually a big fan of bar soaps, I have to say I was thoroughly impressed with this one. Unlike other soaps that tend to mush and fall apart easily, this has lasted me for some time as an exfoliating, hydrating body cleanser. The soap contains small bits of dried rosemary to gently exfoliate away dry skin and increase circulation, something my eternally dry skin was in desperate need of. I've been following up the soap by using the Fez Body Serum, a super absorbent serum that smells divine. Kahina's Fez scent is one I've seen written about on numerous blogs, with many bloggers naming it as one of their top scents of all time. 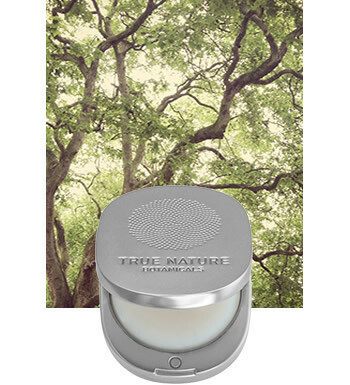 While I don't know if I can quite name it there (I'm partial to slightly more floral woody scents), the earthy, warm fragrance is really one-of-a-kind, and something I have truly enjoyed using. As much as I love both other products, though, the real star of this trio is the brand's Argan Oil. While I've used plenty of products that use argan oil in the past, I've never used it alone. And honestly? I've been missing out. This oil is so lightweight, absorbs quickly, and leaves your skin incredibly hydrated without any greasy residue or clogged pores. Add onto that the fact that you can use it for just about anything (body, face, hair, etc. ), and I'm starting to see why people swear by it. Having recently moved to a (much) more humid climate, I've been in need of an oil that hydrates without weighing my skin down — this fits that need to a T.
Not too long ago, I shared an (extensive) review detailing my thoughts on the amazing May Lindstrom line, and my small sample of The Honey Mud Mask was far and away one of my favorite pieces. For my dry, but easily congested skin, this formula is a total godsend. 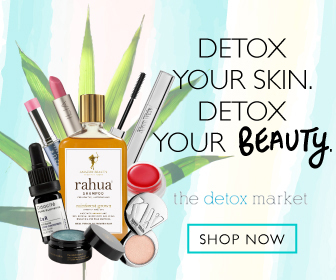 Honey, clay, and silver are the main ingredients here, combining to create a formula that's both hydrating and clarifying — basically, just what the doctor ordered for my skin type. While the main intended purpose for this jar of goodness is as a cleansing silk, I mainly use it as a mask, applying a generous helping of the formula to my face on a weekly basis (though it's hard not to use it every day). I usually leave this heavenly smelling formula on my complexion for 45 minutes to an hour, and each and every time I remove it my skin looks refreshed and luminous. Honestly, it's unlike any other mask I've used before. If you have a similar skin type, there's truly no product I'd recommend more — it might be a pricey pick, but it's truly worth every single penny. 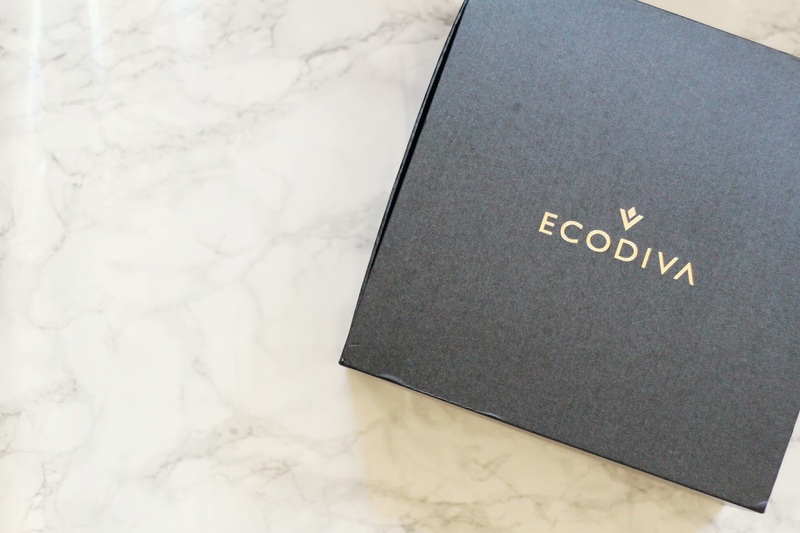 Have you guys shopped at EcoDiva Beauty before? 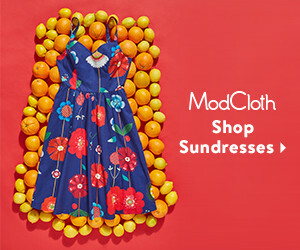 What're your favorite picks from the store? I'd love to hear your thoughts in the comments below!